THE CANINE PREY DRIVE INSTINCT. In this section I will endeavour to explain what the prey drive instinct is, where it comes from and what it could mean for you and how it might influence your choice of dog/ puppy. This topic is not written to worry potential owners but to give you sound advice about an important part of the modern dogs make up and how it could effect you. Be assured that prey drive problems are not a serious problem for most dogs but can be for some dogs and more common in certain breeds (see which breed section) if given the environment and early learning that allow this gene driven behaviour to manifest and become expressed. What is the canine prey drive instinct and where does it come from I hear you say. Well, it is a genetically driven instinct (innate) born out of the fact that the dogs ancestral roots are predatory and carnivorous going back 40million years through the order Carnivora. Fossil records show the wolf evolved from the Caninae sub group, with the wolf being the mother so to speak of the domestic dog, so it surely makes sense that the canine prey drive genes present in the dogs ancestors over millennia will have some effect on the modern dog. 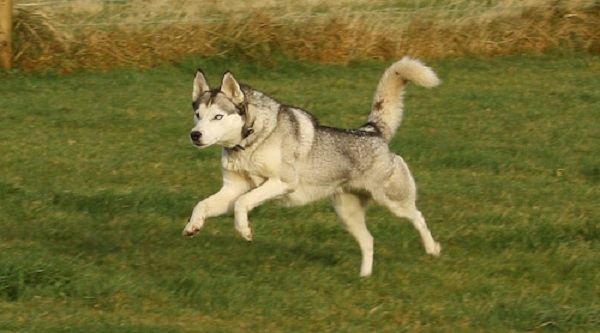 The process of domestication over thousands of years has made this genetic drive somewhat latent in many breeds (but not all) and it can easily be tapped into; all dogs will harbour the prey drive instinct within them to varying degrees. In the wrong hands a dog with a high prey drive instinct can become a problem, especially if the dog is an older dog which one way or another (genetics, training, owner reinforcement, environmental influences, early learning) is using this genetically driven instinct to full effect. The canine prey drive is a sequence of events best seen in full in the wild wolf of today. It takes the form of the The Search (see, hear, smell), The Stalk, The Chase, The bite hold, The bite kill, Dissecting, Consuming. The Wolf carries out this sequence in it's entirety and to good effect for it's life depends on it. It is a true predator in every sense of the word and kills and eats it's prey to survive. It should also be said that like other wild canines it is also a scavenger. Dogs vary greatly from breed to breed and indeed dog to dog within a breed in the amount of prey drive they inherit. Personally I think direct parentage can have a bearing on this and many other inherited behaviours so seeing mum (and indeed dad) when looking at puppies is paramount. Obviously if you are looking at an adult dog this may not be possible. You will probably have seen some of the prey drive in action in yours or others dogs, for instance ragging a toy or clothing (the bite hold,bite kill), the jack russell that goes down a rabbit hole kills the rabbit and stays down there to consume it (uses the full sequence), lurcher’s coursing hares (the full sequence apart from Consuming and sometimes that too), the dog in the park that sees a squirrel stares at it intensely then chases and most times does not catch (uses the search, chase ) though the one that does catch and kill the squirrel is using all the sequence save maybe eating it. The prey drive instinct can be a very powerful genetic drive in some dogs and with some dogs they will be completely driven by their genes and require no external stimulus from the owner to carry it out, with the hormonal high of carrying out the behaviour being it's own reward to them, in effect self rewarding, and they will take no notice of the owner while under it's influence. These sort of dogs will be a danger to other animals in the wrong hands, but again, be assured dogs like this are not common and it is often man that has brought things about. Professional dog trainers in the dog protection industry for instance may look for this trait albeit not too over the top for they still have to have control to train a stop or get out. Dogs with high prey drive are not good though for the in experienced pet owner. There are some breeds with a higher genetic predisposition to this and these are best avoided by the new or inexperienced owner and indeed many experienced owners, they are mentioned in the which breed section but to refresh The Husky, Malamute and Akita are most prolific. When taking on a new dog you should do some research on the breed or if a cross the breeds that are showing most in the cross as some of the other more obscure breeds will have a highish prey drive, the Coonhound, Rhidgeback, for instance, and if early learning, environment and socialisation are not good then prey drive could become a problem. Having said that I think that any breed of dog given the appropriate environment, conditions and early learning can be made to develop a dangerous level of prey drive/aggression, and obviously the larger the dog the more damage that can be done. If for instance you were to take a juvenile dog from a farm where it had been left to it's own devices to kill and maybe eat rats, rabbits, cats, foxes and maybe some of the farm animals you could be sure that it would have developed a high prey drive and have well entrenched behaviour patterns that would cause you much concern, possibly unable to lead a normal (in our domestic environment) life. A dog like this would be a handful for an experienced professional behaviourist to take on let alone an average pet owner. There are indeed some owners out there that walk their dogs on a lead continuously for fear of what they might do to another’s dog or other small animal that comes within reach. If you have a dog with worrying levels of prey drive (not something else), you need to get professional help, the sooner the better for like many behaviours the longer it continues the more entrenched it becomes and so harder to modify, sometimes sadly if the dog is an older dog and the behaviour was learnt from an early age the outlook must be guarded and prevention and management will be better than cure, the prognosis may not be good but things could be improved. I would also like to add here that aggression in all its forms could easily be mistaken by many people as the prey drive in action and more often than not it is not the prey drive instinct in action but a form of aggression from a mal adapted dog that is to blame, aggression caused by being unsocialised, fearful, nervous, clinically ill or injured, the list is long. These dogs are aggressive but don't want to kill the other dog or animal like a true hunter or dog employing the prey drive instinct to it's fullest. Many modern breeds will inherit genes that with the correct training and learning will make them want to carry out some of the prey drive sequence in a working environment as that breed has been selectively bred over many years for a purpose that requires it. In the following examples parts of the prey drive instinct have been utilised and reinforced to get the desired effect for a working dog and to see a good working dog in action is a sight to see, I once watched a sheepdog trial in the lake district where the shepards brought a small number of sheep up a valley taking them through several well spaced gates over a distance of probably half a mile using just whistling and voice command when nearer, amazing dogs. Collie for herding:- using the search, stalk, chase. Labrador retriever:- using the search, bite hold and hereditary genes and training for retrieving. Greyhound/Lurcher:- using the search, chase and often more, dogs that have been trained on live animals (sadly it happens) will have a very high well reinforced prey drive instinct. Terriers for vermin control:- uses all of the prey drive sequence save eating the kill though some will. The search dog:- uses the search part of the sequence and no more and will work tirelessly for a ball or tug of war at the end and they love it. Some dogs with an active, well reinforced drive, will be able to tell the difference between killing a rat or rabbit and someone’s small dog as they will have been properly socialised and trained in every other respect but some will not. I have heard some terrible tales of an owners beloved dog being torn apart by another dog or dogs and only hope that laws in the future will be enforced to punish properly irresponsible owners of such dogs as a real deterrent to help stamp it out. The dogs doing the attacking in these situations are carrying out fairly normal species specific behaviour but obviously it is not acceptable in our human environment, their genetic heritage has through early learning and in some cases owner reinforcement been brought out and a dangerous dog or dogs is the result. Having said all of the above the prey drive instinct and parts of the sequence are good things where working dogs are concerned and the powerful genetic drive is utilised and reinforced in the training of many working breeds, but it is not good for the inexperienced pet owner. If you, as a new or inexperienced pet owner, stay away from the breeds with the highest genetic predisposition to a high prey drive and follow the other advice on this website all should be well. Some of the more common breeds of dog like the terriers and greyhound/lurcher types with a vintage genetic heritability to hunting should not be encouraged to hunt or allowed to kill other small animals by the average pet owner for fear of prey drive problems developing and becoming uncontrollable, (this is really true for all dogs). As I have said above prey drive problems are low down on the list of behaviour problems in dogs, and often it is something else that is driving things, but you need to be aware. If you do for some reason end up with a dog with worrying symptoms then seek professional help as soon as possible. Have a look too at my /high-drive-dogs page for more relevant advice.